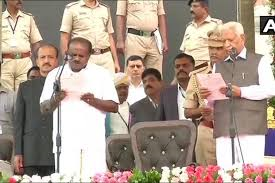 Dasha of Ketu In the natal chart of Kumaraswamy and Dasha of Moon in the Oath taking Chart as Predicted can be a Bolt from the Blue for the Karnataka Political Crisis and seems to take an ugly situation as per the time Frame earlier Predicted and the Crisiss may start from Today itself the Date already Predicted as 14-15th Jan. 2019 in advance . Moon is afflicted badly in all the Varga charts and seems the Dasha starting from Venus is Bad and till The Dasha of Moon who is afflicted badly in the chart may not be good after 139 days for 152 days specially when Saturn and Sun are in conjunctionin Transit and over the natal Sun and Saturn in the Natal chart Of Kumaraswamy. Hence till 14-15th Jan. 2019 most venomous from Him and the Coalition Govt. in Karnataka.although after the lapse of 139 days when Dasha of Moon Starts from 9th Oct. 2018 will be most troublesome. The Maleficence of Moon till the 30th Jan. 2019 can be a bolt from the blue ot so seems . The differences will start after 4 days/ 4 weeks/ as can be seen by the difference in the degrees of the Lagnesh Venus and Malefic Saturn , there will be degree aspect on the Venus by Saturn on the 26th May 2018 the 4th Day from the Oath Taking , Also Mars and Sun Poorna Ithasla can bring Malefic Results when Sun transits the Sign Capricorn where Mars is placed . Sun will reach the Mars degrees on the 23rd Jan. 2019 may Bring a down fall in the Govt. it so seems . Hence from the 14-15th Jan. to 30 Jan. 2019 will be aperiod of Political Tug of War with in the Karnataka Govt. The Transit Of Ketu in the 8th house from Lagna and Moon and further Sun ingress in the 8th house after 14th Jan.2019 seems to be a Bolt from the blue for him .